Here's a review for Jitterbug vs Consumer Cellular including the differences between GreatCall and Consumer Cellular phones and plans. These two companies focused on the senior's segment of the cell phone service market, and here we’ll mention the pros and cons of each company. 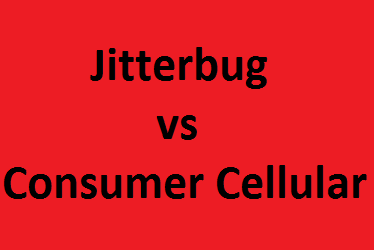 Check out the Jitterbug phone plans review. Check out the Consumer Cellular plans review. Consumer Cellular runs on the AT&T’s network. Excellent US-based customer service via phone. Cheap rates for seniors who don’t use their cell phone often. Low cost shared plans, you can add additional lines for $15/line, per month. The option to buy time at Target stores. Exclusive AARP members discounts on monthly plans and phone accessories; check out the AARP Phones. Offers pecial cell phones for seniors like the Doro PhoneEasy 626 and the Doro Smarteasy 824. Very expensive for heavy cell phone users or who want unlimited talk and text plans. High-speed data usage limitation (only 4GB of high-speed data), you can use more data at lower speed. Lack of exceptions such as Apple MMS not working on some AT&T’s MVNOs. The Jitterbug phone service (GreatCall service) runs on the Verizon’s network. The Jitterbug phones are the best phones for seniors who are looking for ease-of-use, and health/safety features. Offers medical and safety services, which are excellent value for senior citizens who live by themselves. More expensive than Consumer Cellular if you’re not planning to get a health and safety package. Unlimited talk and text plus 100 MB for $50 per month. 300 text messages for $3/month. 700 text messages for $6/month. 1250 text messages for $10/month. 2500 text messages for $15/month. GreatCall offers the Basic, Preferred, and Ultimate Packages for $20, $25, and $35 per month respectively. 250 minutes for $15 per month. Unlimited minutes for $20 per month. TEXT and Data plans "all plans have unlimited text messages"
250 MB for $5 per month. 1 GB for $10 per month. 3 GB for $20 per month. 5 GB for $30 per month. 10 GB for $40 per month. You can add additional lines for $15/line, per month. The currently available Jitterbug phones are only two models; the Jitterbug Flip, which is a flip phone for seniors, and the Jitterbug Smart, which is a simplified Android phone for seniors. The currently available Consumer Cellular phones start from basic phones to top smartphones brands. The Doro phone models offered by Consumer Cellular are the most important for seniors. There are two Doro phones available at the current time the Doro PhoneEasy 626, which is a flip phone for seniors, and the Doro Smarteasy 824, which is a simplified Android phone for seniors.